We look forward to welcoming you as a visitor to our church and community! Generally speaking, wear whatever makes you feel comfortable. We have folks in jeans, some in dresses and suits, and almost everything in between. It is more important that you are here than what you are wearing. There are several parking areas. Some people park along Church St., others in the grass and mulch lot off 1st St. A few park in the Elementary School lot across 1st St. from the church. Your church has a lot of doors, which one do I enter for worship? 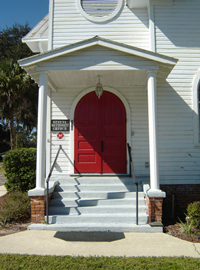 The main entrance is the set of red doors that face 1st St. There is a second door that is reached by following the sidewalk on the Church St. side of the building. This entrance has no stairs and is easier for those with limited mobility to use. It provides access to the sanctuary adjacent to the chancel. What kind of worship do you have? A lot of the time when someone asks that question, they want to know about the music. We use a variety of music styles in worship, sometimes singing praise songs, sometimes the old favorite hymns, often a mix within each worship service. Where can I leave my contact information? Please sign the visitor's book that is located in the entry way (Narthex) of the church. Is everyone welcome to receive communion? Absolutely, The Methodist Church has an open table, which means you do not have to be a member of this or any church to receive communion. Every Sunday, communion is served using intinction -- receiving a piece of bread from one loaf, then moving to the chalice and dipping the bread in the cup, which contains unfermented grape juice. Is there anything else a visitor should know? Yes, our Sunday worship called Word and Table. We have scripture readings, a sermon, and participate in communion every Sunday. On the first Sunday of each month, following worship, we have a church-wide potluck lunch in Ward Hall. Please feel welcome to attend. Even if you have forgotten or did not bring something to share, please feel welcome to dine and enjoy the fellowship. If you would like to meet with the pastor before or after visiting worship for the first time, please click here to email.